While the world and their dog celebrate romantic love in February, April Love is all about extending love and kindness to ourselves. In last year’s inaugural challenge we explored self-love and self-care so this year we’re taking another route. 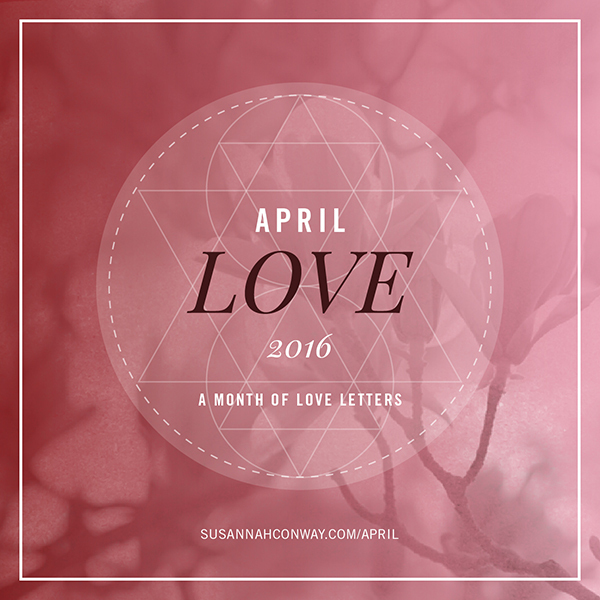 Welcome to April Love: A Month of Love Letters! I am *so* ready for this — you too? For this year’s challenge I’ve put together a list of 30 prompts inviting you to write — or photograph or draw or collage — a love letter every day in April. Each prompt starts with “Dear…” and all address various parts of our selves and our world. Every day in April has a different prompt and the idea is to write a daily letter in your journal — or craft a poem or take a photograph or paint a picture or make a collage or write a blog post, etc — in response to the prompt. To practice love, kindness, honesty and probably a smidge of vulnerability, too. To find gratitude for what we have, where we’ve been and where we’re going. Even though you’ll be offered a prompt every day there is no “homework” — meaning, don’t worry about trying to keep up! Do what you can when you feel inspired, cherry-pick the prompts you resonate with, leave the ones you don’t (or save ’em for another time!) and enjoy this month of community. This year’s April Love is definitely more of a personal voyage, one that I believe will weave some real magic when tackled privately in your journal. It’s also a wordy-er challenge than last year’s, though you can still use each prompt as photo inspiration, of course! However you tackle the love letters, it’s always special when we come together as a group, so we’ll have a private Facebook group where we can gather and share, an Instagram hashtag (#AprilLove2016), a blog roll and you can also sign up for inspirational daily emails — more on that below! This year I’ve invited a fabulous group of women to inspire us with their own take on the prompts. Each day in April you’ll be emailed a quick suggestion on how to tackle that day’s letter along with a heart-felt example from one of the souls below. At the end of the challenge I plan to put all the letters together into a (free) ebook which I’ll send to you — it’ll be a lovely companion to last year’s April Love pdf. Get ready to hear from me and Alisha Somer, Amy Palko, Andrea Schroeder, Bridget Luff, Caroline Donahue, Eli Trier, Elizabeth Duvivier, Jeanette LeBlanc, Jen Lemen, Jenn Lee, Julie Daley, Lianne Raymond, Liv Lane, Meghan Genge, Michelle Marie McGrath, Michelle McCartan, Mindy Tsonas, Rachel Cole, Randi Buckley, Ronna Detrick, Sandi Amorim, Sara Blackthorne, Tammy Strobel, Tanya Geisler and Vivienne McMaster. I LOVE this! I’m excited to participate. One of my goals lately has been to be kinder to myself so this will definitely help me be more mindful! Last April Love I met some of the most wonderful women and I was changed in ways I can not begin to say. A small group, maybe 17 of us formed a group and from that another group formed and we are together still. We have become a tribe, soul sisters, we call ourselves Birds of a Feather as feathers are our symbol and we have all found feathers in the wild when we have needed special signs. This is from April Love. 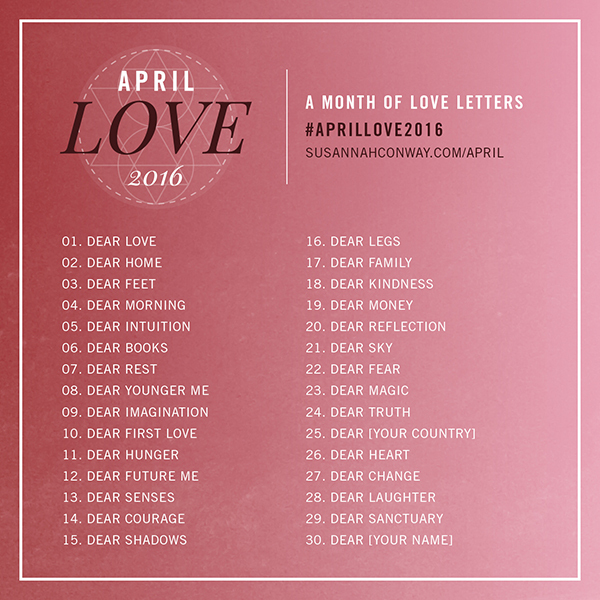 Most all of us are joining April Love again this year and are so looking forward to sharing as a part of the group as well as in our own little group. Thank you Susannah for all that you do. My 17 yo daughter and I are both joining the month of LOVE. Hi Susannah love! I tried to sign up, and it said I am already signed up! I signed up last year, so maybe that put me automatically back in…or perhaps it was magic! I’m in Heidi’s feather group. It’s such a lovely offshoot of all you do, but I miss you, foxy sista! All signed up, can’t wait! So excited for another April Love! Last year’s was terrific. Thanks Susannah! Oh I think you’ve posted just when I needed some inspiration.